Make sure you’re dressed warmly, so you can help these penguins to make the biggest snowman ever. 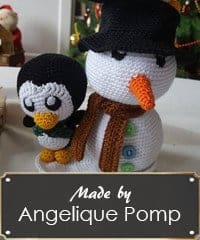 The Snow Fun project will be about 24 cm tall and can be a nice decoration for Christmas. Such good timing for this pattern – I woke up to 10 cm of snow this morning! I just love the multicoloured buttons! Such a fun take ? OMG the penguins are so cute! I will have to add these to my list to make this year. Oh! Comme ils sont mignons ?? This is super cute! 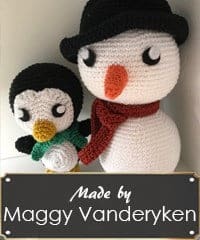 I have been wanting to make a cute snowman!!! Awwww, another cutie. Great job Sabrina. Congratulations! You’re one of the winners of the giveaway.